Just a short note, we have your complete system including roof top trolley. We have been to Cape York, Old Dixie track & several corrugated roads and have not had a problem with your loader. I watched my neighbor put his boat on with a rear loader I then knew I had made the correct decision, so much easier with your system a pleasure to use, because it just works! Thanks again, S & J Potter. I wanted to send you a quick email to let you know that we are back from our 6 weeks in the Kimberley’s and are absolutely stoked in how the Sidewinder boat loader performed. We did over 8500km, 2000km on rough corrugated roads, and the loader was rock solid from start to finish. 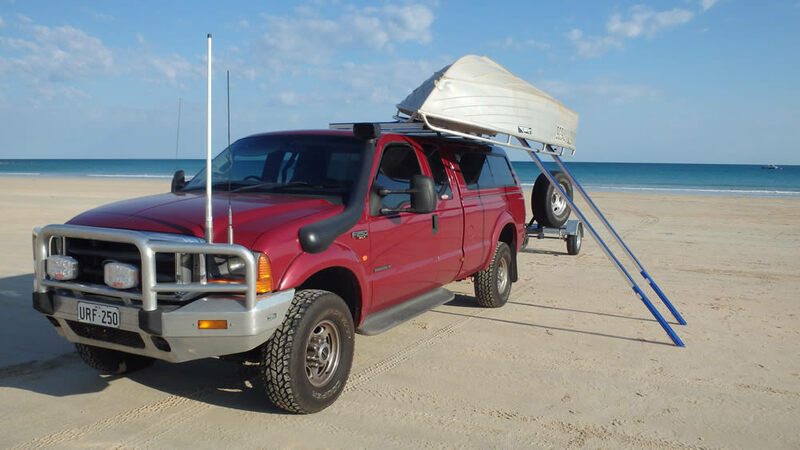 The ease in loading and unloading is second to none and attracted quite a bit of attention down at the beach. To say we are happy is an understatement.